Close by me forever, and love me, I pray. Bless all the dear children in thy tender care, And take us to heaven, to live with Thee there." Today is 21 December, the winter solstice, the longest night of the year. It's a day to be mindful of those who are hurting near Christmas- those who plead with the Child to be near and remain with them in their pain. 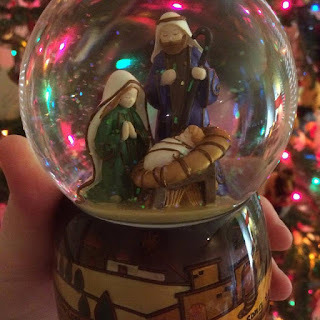 Along the base of the snowglobe are these words: "Christ's birth brought God's love song to earth." So on this longest night, may you feel God's love song playing just for you. If you are aware of others' pain, bless them with your love.